The 100WX offers a truly best-in-class solution at a better price point than any other weather monitoring system on the market today. Reliability and superior accuracy, along with no moving parts and plug and play installation, makes the 100WX an easy and affordable choice for any weather solution. 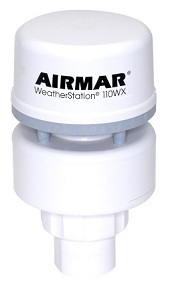 The Airmar WX WeatherStation® instruments are unique, as they are the only weather monitoring system to offer true and apparent wind speed and direction in one compact housing—without the need for additional sensors. Ideal for stationary applications, the 100WX model offers apparent wind speed and direction, air temperature, and barometric pressure readings. The 110WX offers a truly best-in-class solution at a better price point than any other weather monitoring system on the market today. Reliability and superior accuracy, along with no moving parts and plug and play installation, makes the 110WX an easy and affordable choice for any weather solution. The Airmar WX WeatherStation® instruments are unique, as they are the only weather monitoring system to offer true and apparent wind speed and direction in one compact housing—without the need for additional sensors. Ideal for stationary applications, the 110WX model offers apparent wind speed and direction, air temperature, and barometric pressure readings. 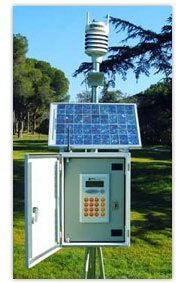 The WX Series WeatherStation® instruments meet a growing need for real-time, site-specific weather information. For moving applications where true and apparent wind are different, the 150WX is recommended and includes additional sensors such as a 10Hz GPS, solid-state compass, tilt sensors and a field replaceable relative humidity sensor. This model features configurable RS232, RS422 and CAN BUS digital data outputs, providing unparalleled versatility for all your weather monitoring needs. The WX Series WeatherStation® instruments meet a growing need for real-time, site-specific weather information. For moving applications where true and apparent wind are different, the 200WX is recommended and includes additional sensors such as a 10Hz GPS, solid-state compass, tilt sensors and a field replaceable relative humidity sensor. 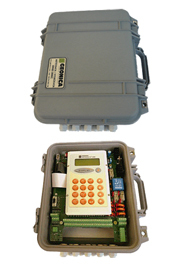 This model features configurable RS232, RS422 and CAN BUS digital data outputs, providing unparalleled versatility for all your weather monitoring needs. This new unit offers a truly best-in-class solution at a better price point that any other weather monitoring system on the market today. of all the information received.